Welcome to the Classroom! You and your peers can take this multiplayer dungeon exam together! 1. 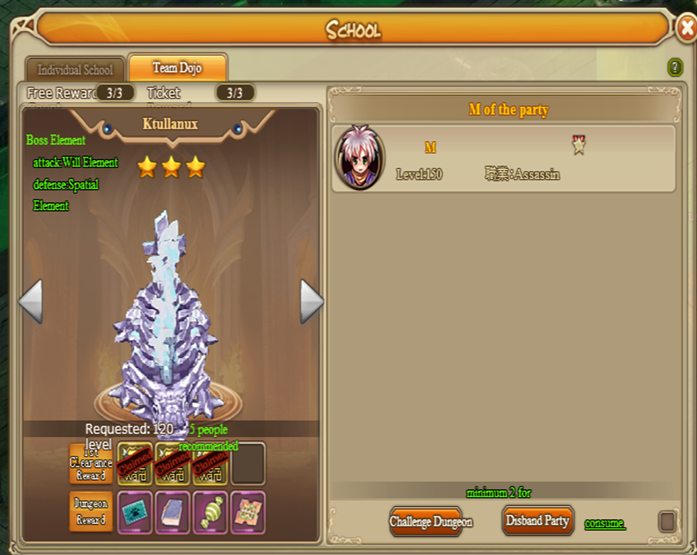 Red Potions can't be used and and equipment can't be changed in this dungeon. 2. Rewards are sent based on your team star rating. Clear a stage to unlock the next level. 3. Players can join the dungeon as many times as they want, but there are only 6 challenge attempts with rewards. The first 3 attempts are free of charge while the remaining 3 attempts will require tickets (Failure or quitting will consume 1 challenge attempt). 4. Only 2-5 players are allowed in a dungeon challenge at the same time and they can't enter until all the teammates get ready. 5. Players who fail the dungeon will be forced to exit and receive no rewards. 6. Players in team status can't enter the dungeon. 7. A reasonable job match is highly recommended.